Models, esp. 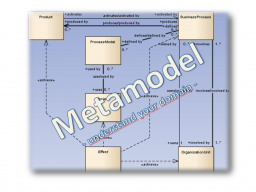 Metamodels are important to understand your business domain. They are important to sharpen your technical specification. They enrich the semantics of your specification objects by having them semantically connected. Metamodels answer the questions on what and how a specification content has to be designed. Metamodels lead you to multidimensional specifications due to the fact that a relationship dimension has been added. The topic sysML/UML Metamodels covers the questions. which areas of business are typical. I will express how sysML/UML-Metamodells can be used as glossary and specification foundation for systems and architectures. In connection hereby, it is shown how abstractions can be helpful. I also express that Metamodels can lead to an early focusing in an project that follows agile process models without committing to certain solutions too early. If you want to become active in the webinar, please see the 4 minute introduction before the Webinar.